Inspired by the classic 40 Clove Chicken, this amazing slow-cooked casserole of falling-off-the-bone, garlic-scented chicken is worth the wait. 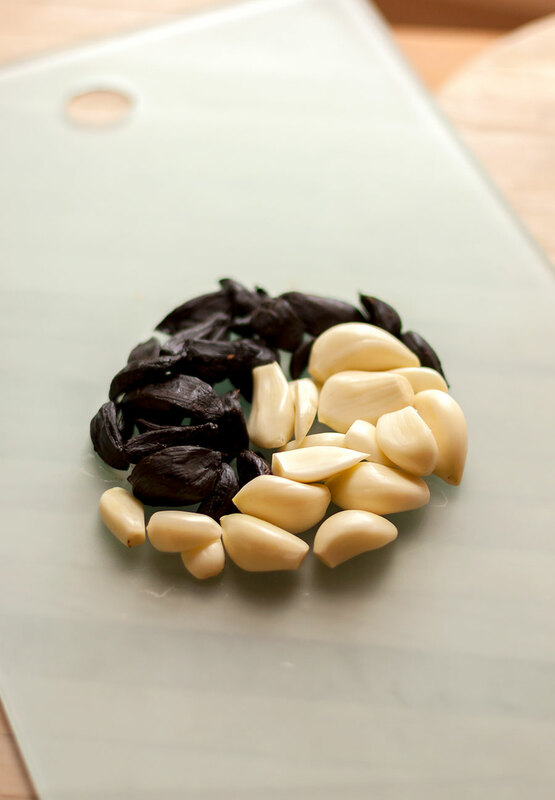 Yes, we actually used 40 cloves of garlic in this dish – 20 cloves of regular, every day fresh garlic and 20 of the startlingly ebony-colored black garlic. In case you’re unfamiliar with the stuff, black garlic is not a new strain of garlic; it’s created by fermenting whole heads of normal garlic in a carefully controlled environment of heat and humidity for several weeks. This fermentation process results in soft, jammy, jet-black cloves of garlic with a complex flavor that is reminiscent of licorice, fennel and balsamic vinegar – with subtle, but distinct notes of pure garlic shining through. 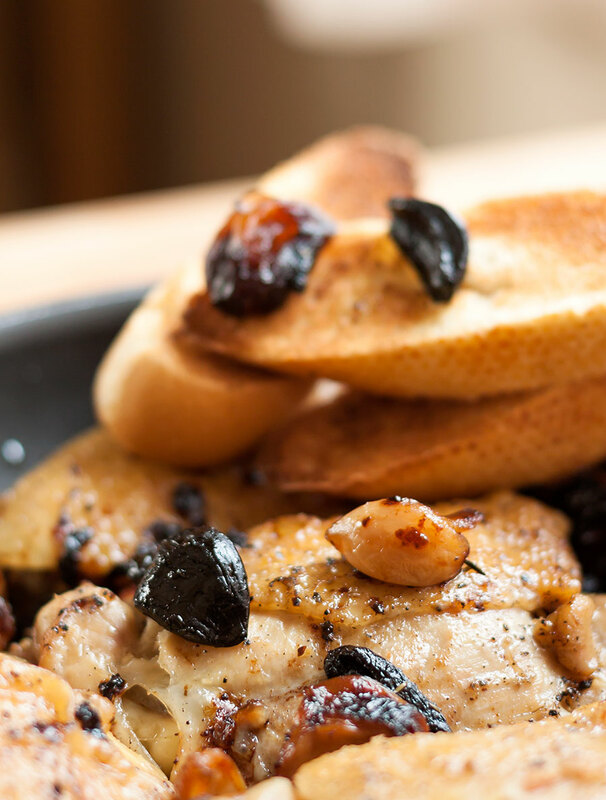 Simmering the garlic and chicken together with fresh herbs and a liberal amount of good olive oil yields a dish that much resembles a confit, but the black garlic is what sets this dish apart from other versions, adding layer upon layer of rich, complex flavor. The lengthy cooking time in a tightly covered pan seals in all the juices, allowing the essences of slow-cooked garlic, herbs and olive oil to meld together while the chicken becomes incredibly tender. 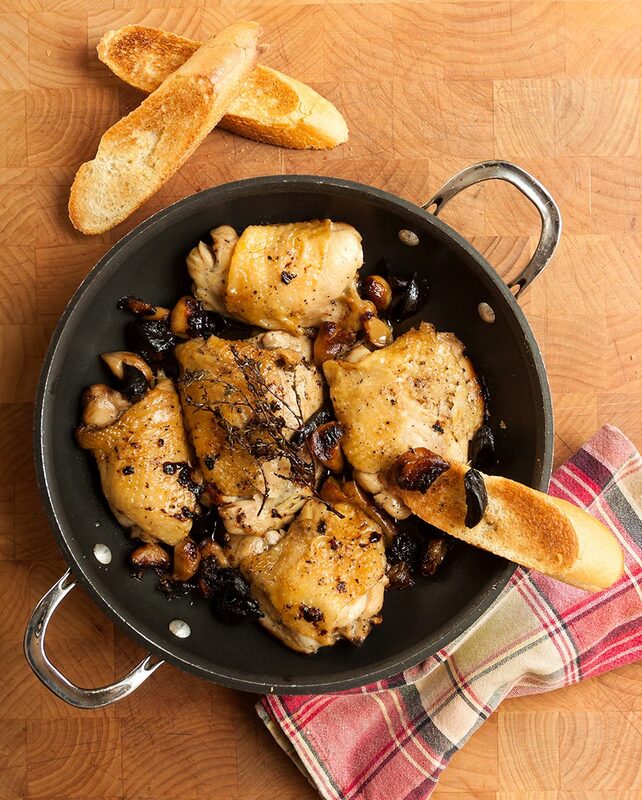 While this dish cooks, the whole house will fill with the rich aromas of garlic, chicken and olive oil. Serve with a crusty baguette to smear with the buttery-soft garlic cloves. Use the rest of the bread to mop up every bit of the rich sauce. Remove any excess fat from the chicken and season generously with salt and pepper. Coat on all sides with 2 tablespoons of the olive oil. Heat a large oven-proof sauté pan over high heat. When the pan is hot, add the chicken and cook for about 5 minutes, turning to cook for another 5 minutes, until well browned on both sides. Remove the pan from the heat and pour off the rendered fat (remember, we’re adding more olive oil in the next step). Drizzle with the remaining 1/2 cup of olive oil. Stir in the elixir of truffles, evenly distribute the thyme sprigs and sprinkle all of the black and white garlic cloves over the top. Cover tightly and slip into the oven to bake for 90 minutes. Hint: if you don’t have a close-fitting lid, cover the pan with aluminum foil, then place the lid on top. We want to seal in all of the juice & flavor of the garlic and chicken. Remove the pan from the oven and set it aside to rest for 15 minutes with the lid on. Uncover and discard the thyme sprigs. Serve with grilled or toasted baguette slices to scoop up all of the fragrant olive oil and meltingly soft, delicious garlic cloves.